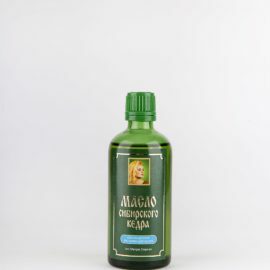 Cedar Nut Oil Cold Pressed with Sea-Buckthorn, 100 ml. Cedar Nut Oil is the first cold pressed oil with addition of natural sea-buckthorn extract. 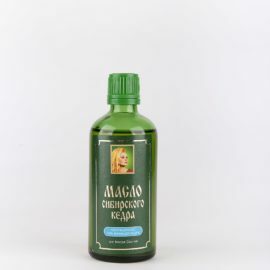 It has the mildest taste among the entire line of enriched oils, which makes it very popular with children and suitable for sensitive people. 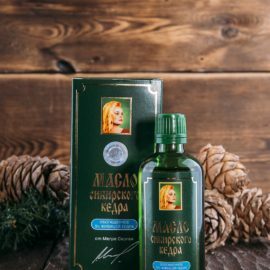 Qualities of sea-buckthorn enhance properties of the Cedar Nut Oil, which make it an effective means of avitaminosis prevention and treatment. Sea-buckthorn is a truly unique source of vitamins and minerals. Almost the whole periodic table (potassium, calcium, zinc, iodine, phosphorus, magnesium, and more than 20 elements), vitamins B1, B2, C, E, K, niacin, beta-carotene, folic acid and other organic acids can be found in the plant. 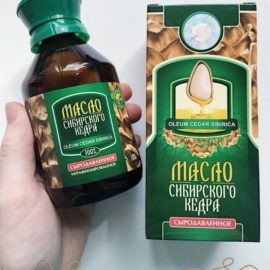 Sea-buckthorn as a strong natural antibiotic is also a good immunostimulant and wound-healing agent, which can help in the treatment of colds and viral diseases. Cedar Nut Oil enriched with sea-buckthorn enhances the healing powers of the body, helps to heal cracked, sore skin and internal organs. 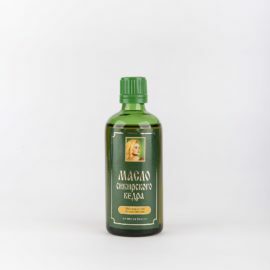 It has antioxidant properties, rejuvenates the body and improves metabolism and cell renewal process due to high concentration of vitamin E.
Mass fraction of sea-buckthorn extract is not less than 5%.